It often takes me months, and in the case of Jerusha, years, for the metamorphosis from original idea to finished sweater design. In 2008, my family took a trip to New Zealand, and I saw the heart-shaped motif painted on the ceiling of a Maori ceremonial house. For a long time I compared my copy of the design, scribbled on the back of a cash register receipt, to images in books and online, finally finding it in a Dover publication. By that time, I had learned of my seven-times great grandmother, Jerusha Gordon, who with her husband James, a veteran of the American Revolution, trekked into the wilds of western NY to settle in a hilly township that was beautifully similar to the landscape where I first saw the Maori paintings. The name and the design fit. I hope I have done justice to Jerusha's pioneer spirit." 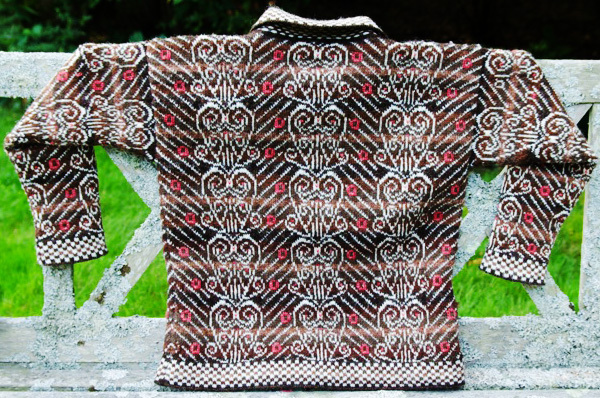 Jerusha is my way of combining my love of history, colorwork, embellishment, and couture finishing in a traditional drop shoulder, crew neck stranded sweater silhouette in the colors of woods in deep winter. Loose-fitting, worked from the bottom up and knit entirely in the round, steeks are added for the center front, crew neck edge and armholes. Sleeves are knit in the round from shoulder to wrist and the wrists are lined with a self facing. The bottom and front edges and collar are finished with self facings. 30 sts/35 rounds = 4 inches in colorwork pattern (Chart 1). 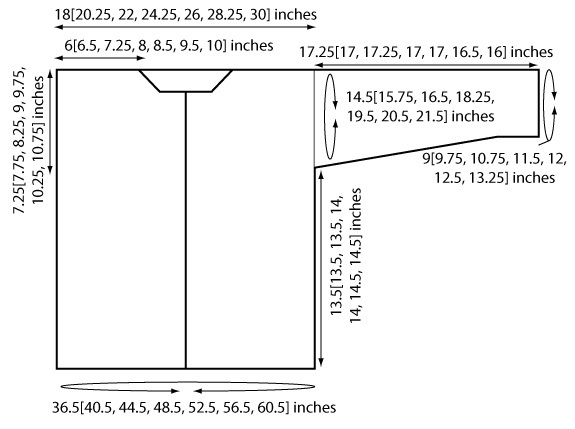 To save time and to ensure proper fit, take time to check gauge by making a swatch of at least one repeat of Chart 1. All charts are worked in Stockinette stitch (knit on RS rows/rounds, purl on WS rows). A steek is a set of extra stitches placed at garment openings (center front, right and left armhole openings, and crewneck) to permit the entire sweater body to be worked in one piece in the round. Steek stitches are worked in alternating foreground and background colors, with the outside edge stitches always worked in the background color. Nine stitches is an arbitrary number and may be reduced, but generally to no fewer than four stitches. Once the garment is finished, the steeks are reinforced with crochet or sewing stitches, and then cut open along the middle stitch. Color changes are always made in the middle of the front steek. To reinforce steeks, using either the crochet method (see here) or a fine (size 70) sewing machine needle and all-purpose thread, stitch along the one vertical column of stitches just inside the edges of each steek. Reinforce all of the steeks at once, but cut them open only when ready to work that particular section. Do not use monofilament to reinforce steeks. Two-color stranded colorwork is made by carrying the unused color loosely along the back of the work. These strands or "floats" should lie flat on the inside of the work, being neither too tight nor too loose. When changing colors, knit one stitch of the new color, then gently spread out the new stitches. This will help ensure the floats are just the right length. When changing colors where there is no steek (e.g. when working the sleeves), weave in the new color two inches before the underarm seam and the old color two inches after the underarm seam. Using MC and larger circular needle, CO 280[310, 340, 370, 400, 430, 460] sts, pm for center of front steek and beg of rnd, and join to work in the round, being careful not to twist sts. Round 1: Working Row 1 of Bottom Welt Chart across entirety of row, work 5[5, 5, 5, 5, 5, 5] sts for first half of center front steek, pm, work 68[75, 83, 90, 98, 105, 113] sts for Right Front, pm, work 135[151, 165, 181, 195, 211, 225] sts for Back, pm, work 68[76, 83, 90, 98, 105, 113] sts for Left Front, pm, work 4 sts for rem half of center front steek. Work even in Bottom Welt Chart as est for 13 rounds more. Bottom Welt Chart is completed. Next round: With MC only, knit all sts. Note: Begin with Round 1 of Steek Chart and Chart 1. Continue in chart patts as est, knitting side seam cast on sts in dominant color of round (MC on Rounds 1-3, CC1 on Rounds 4-9, etc.) until sweater measures 13.5[13.5, 13.5, 14, 14, 14.5, 14.5] inches from cast on edge, or desired length to armhole. Continue to work in pattern until sweater measures 5.75[6, 6.5, 7.25, 7.5, 8, 8.25] inches from beg of armhole. Next round: BO 5 Steek sts following patt for stitches 5-9 of Steek Chart, BO next 10[12, 14, 15, 15, 16, 18] Right Front sts in patt, patt to last 10[12, 14, 15, 15, 16, 18] sts of Left Front before beg of Steek Chart, BO rem sts to end of rnd in patt. Break yarn. Pm, cast on 4 sts following patt for sts 1-4 of current row of Steek Chart and replace marker for beg of round. Next round: CO 5 sts following stitches 5-9 of next row of Steek Chart. Pm. Ssk, work in est patt to last 2 sts of Left Front, k2tog, sl m, work stitches 1-4 of Steek Chart. Decrease round: Work sts 5-9 of Steek Chart, sl m, ssk, patt to last 2 sts of Left Front, k2tog, sl m, work sts 1-4 of Steek Chart. Next round: BO first 5 Steek sts, patt across rem 45[49, 54, 60, 64, 71, 75] sts of Right Front and place these sts on a holder, BO next 9 steek sts, patt across next 45[49, 54, 60, 64, 71, 75] sts of Back and place these sts on a holder, patt across next 45[53, 57, 61, 67, 69, 75] sts of Back and place these sts on holder for Back Neck, patt across next 45[49, 54, 60, 64, 71, 75] sts of Back and place these sts on a holder, BO next 9 steek sts, patt across next 45[49, 54, 60, 64, 71, 75] sts of Left Front and place these sts on a holder, BO last 4 Steek sts. 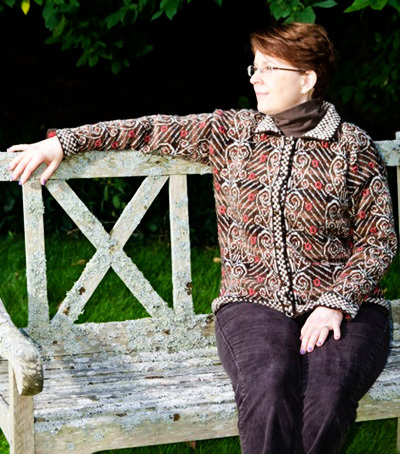 Join stitches on holders for Front and Back shoulders using three-needle bind off. Note: Sleeve stitches are picked up along armhole steek edge, then worked in the round from shoulder down to wrist. The chart pattern is intended to be centered at the shoulder seam. If you adjust the number of sts picked up, adjust the centering of the pattern accordingly. Reinforce and cut first armhole steek. Round 1: Work side seam st in dominant colour of round, sl m, beginning with stitch 77[72, 69, 63, 58, 54, 50] of chart, work Sleeve Chart to end of round, ending on st 11[16, 19, 25, 30, 34, 38]. Work 3 more rounds even in patt. Decrease round: Work side seam st, sl m, ssk, patt to last 2 sts, k2tog. Cont in patt until sleeve measures 15.75[15.5, 15.75, 15.5, 15.5, 15, 14.5] inches from shoulder, or 1.5in shorter than desired length. Knit 1 round with MC. 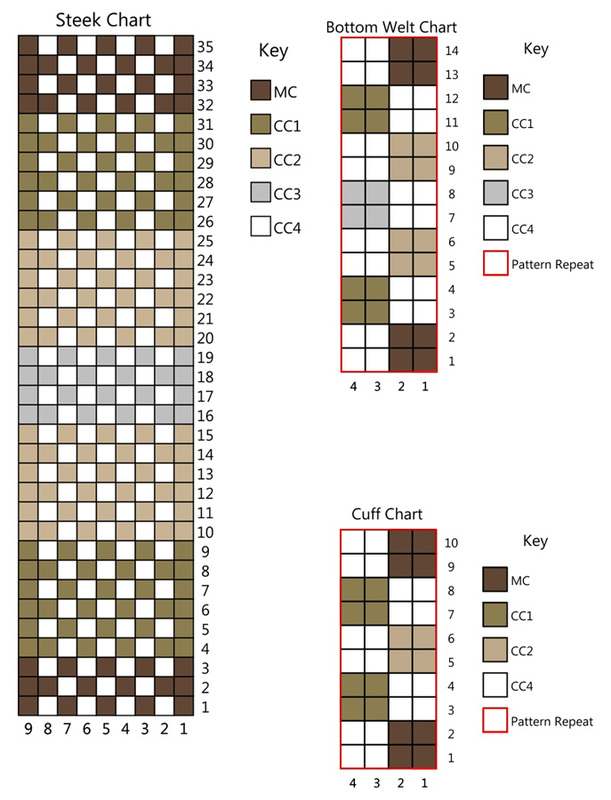 Work Rounds 1-10 of Cuff Chart pattern, ending on stitch 4[2, 4, 2, 2, 2, 4] of chart. Purl 1 round with MC. Turning round: Knit in MC. Change to smaller needles and continue in St st with MC only until cuff measures 1.5 inches from Turning round. BO all sts. Fold piece inside work at Turning round and tack to sleeve. With RS facing, larger circular needles and MC, pick up 280[310, 340, 370, 400, 430, 460] sts around cast on edge, picking up 1 st for each cast on st. Do not join. Change to smaller circular needles and, beg with a RS row, work in St st until piece measures 1.5 inches from Turning row. BO all sts. Fold piece inside work at Turning row and tack to hem. Reinforce and cut front and neck steeks. With RS facing, larger circular needle and MC, beginning at neck edge of Left Front, pick up and knit 140[144, 148, 152, 152, 160, 164] sts (approx. 6 sts for every 7 rows) down to hem. Work Rows 1-6 of Cuff Chart, working in St st and carrying unused strands on the inside of the work. Knit 1 row in MC. Turning row [WS]: Knit in MC. Change to smaller needles and work in St st with MC until piece measures 1.25 inches from Turning row. BO all sts. Fold work at Turning row and tack to inside of work, being sure to fold the raw steek edge inside the facing. Mark placement for seven evenly-spaced buttons on buttonband, with one three sts from the neck edge and one three sts from the bottom edge. With RS facing, larger circular needle and MC, beginning at hem of Right Front, pick up and knit 140[144, 148, 152, 152, 160, 164] sts (approx. 6 sts for every 7 rows) to neck edge. Work Rows 1-3 of Cuff Chart. Buttonhole Row 1 [WS]: *Patt to 2 sts before buttonhole placement (as corresponds to buttonband markers), ssp, yo twice, p2tog; rep from * six times more, patt to end. Note: Do not remove markers on buttonband, as these will be used to place buttonholes on facing. Buttonhole Row 2 [RS]: Work in est chart patt, working double yos as k1, p1. Work Row 6 of Cuff Chart. Change to smaller needles and work in St st with MC until piece reaches to Buttonhole Row 2 when folded at Turning row (approx. 0.75 inches from Turning row), ending after a RS row. Cont in St st until piece measures 1.5 inches from Turning row. Note: The collar is folded down, so the RS of the collar is the WS of the rest of the work. Knit 2 rows with MC. Row 1 [RS]: K1 with MC, work Row 1 of Bottom Welt Chart to last st, ending on stitch 4[2, 2, 4, 4, 2, 4], k1 with MC. Row 2 [WS]: P1 with MC, beg with stitch 4[2, 2, 4, 4, 2, 4], work next row of Bottom Welt Chart to last st, p1 with MC. Cont in set patt until Rows 1-14 of Bottom Welt Chart have been worked twice (for 28 total rows of chart). Knit 2 rows with MC and break yarn, leaving sts on needle. Using smaller circular needle and RS of collar facing, reattach yarn at corner between buttonband and vertical edge of collar. Pick up and knit 28 sts to corner of collar, pm, knit 1 st from held collar sts (this becomes the facing corner), pm, knit to last collar st, pm, knit last collar st, pm, then pick up and knit 28 sts down to buttonhole band. Next Row [RS]: *Knit to 1 st before marker, sk2p (moving markers as needed and replacing markers on either side of double decrease); rep from * once more, knit to end. Rep last two rows until facing measures 1 inch long from picked up sts at sides of collar. BO all sts and tack facing to underside of collar. Using CC4 and yarn needle, duplicate st over Body and Sleeves as shown on Sleeve Chart and Chart 1. When moving from motif to motif, carry extra accent yarn underneath main pattern strands on the wrong side. 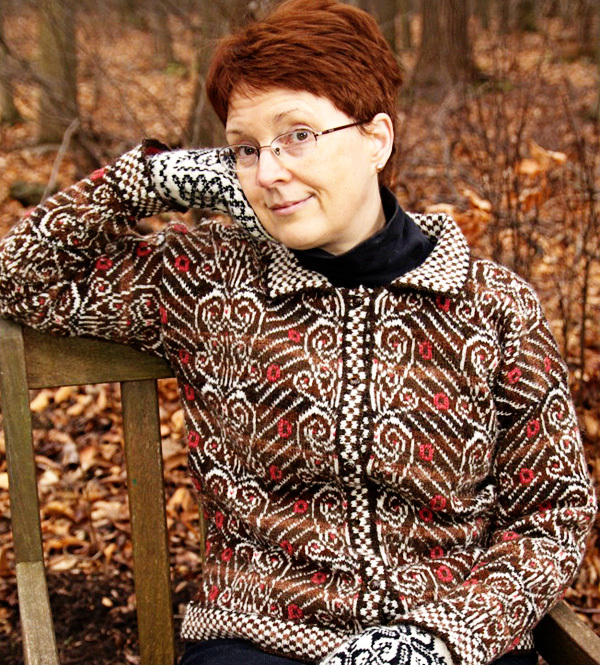 Nancy Vandivert happily admits to being a knitting nerd. 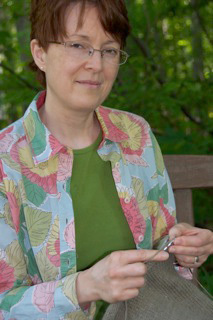 She knits, crochets, spins, teaches, sews, and lives outside of Rochester, NY with her husband, two college-age daughters, and three cats. 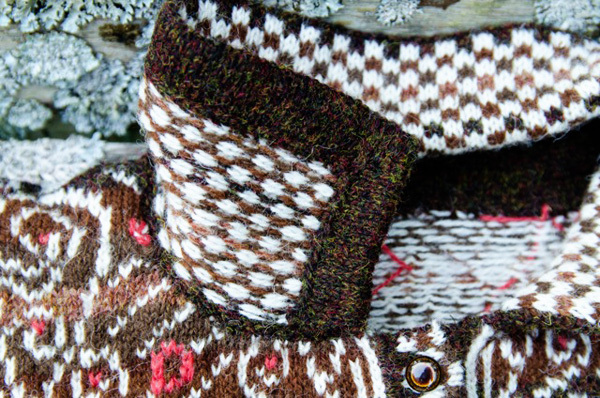 Besides designing, her other knitting passions are ethnic mittens and sharing different knitting traditions with whoever will listen. She has been published in CAST ON magazine and her Lilac Festival Bag pattern won second place in the 2011 TKGA Masters Design contest and is available from Yarnmarket.com. Her other designs and full teaching schedule can be found here.